I bought this on a recent trip to London, when I was able to squeeze a visit to Henry Pordes Books on Charing Cross Road in between meetings. £7 all in. I picked up Pierre Magnan’s Death in Truffle Wood on the same trip and will be reviewing that in due course. I’ve read plenty of Ruth Rendell’s work, but never one by her alter ego Barbara Vine, so I was looking forward to this. The story switches between 1986 and 1976 and uses three main points of view. Pedantic and charmless Adam Verne-Smith owns a software company. The charismatic Dr Rufus Fletcher is an up-and-coming gynaecologist with a Wimpole Street practice. Shiva Manjusri is an assistant in an East London pharmacy. But ten years previously they were all living the hippy lifestyle for one golden summer in Ecalpemos. The three guard a guilty secret from their shared past, and that secret is slowly revealed as the book progresses, although the end-point is clear from chapter one: the bodies of a young woman and child are unearthed in a Suffolk woodland. Rendell/Vine is a great stylist and really shows off. The doctor, Rufus, does not attend the inquest but is able to imaginatively reconstruct the pathologist’s evidence to the court. Meanwhile, she plays with Adam’s job, using an extended metaphor of him using a mental ‘Esc’ key to suppress unwanted memories. Even the location of Ecalpemos is hidden for a while. The ‘long hot summer’ of 1976 is lovingly evoked, as is the carefree life of people in the early twenties, both of which serve to make life at Ecalpemos seem Edenic: obviously someone gets them cast out, but who? And who do the bodies belong to? Potential victims come and go in 1976 with no hint of their whereabouts in 1986. Rendell’s young women are much more rounded and interesting than the young men, who are basically loafing around. Liz Taylor lookalike Mary single-mindedly pursues her dream to get to Greece. Runaway Zosie is disturbed and mysterious in equal quantities. Spiritual seeker-after-truth Vivien is Ecalpemos’ earth-mother. Incident by recalled incident, the memories of the three men tell the story of Ecalpemos and build slowly to a tragic finale. A Fatal Inversion is nostalgic, intelligent and soulful crime fiction at its best. Now that I’ve begun sharing YouTube clips on here, here is a trailer for the 1992 TV adaptation of A Fatal Inversion. 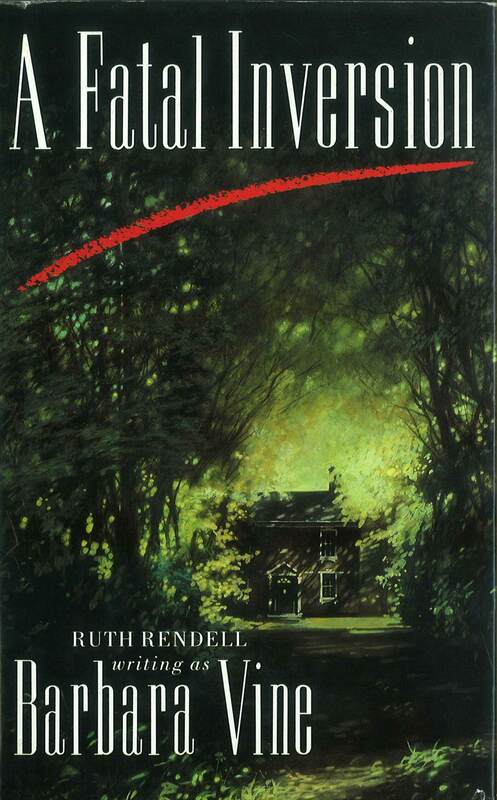 Gallery | This entry was posted in Classic mystery book review, History-mystery, Witness Statements and tagged 1980s, Barbara Vine, classic crime review, CWA, History-mystery, Ruth Rendell, UK, Viking. Bookmark the permalink. Rich – Rendell is really talented I think at slowly peeling away layers as she tells stories, whether she tells them as Ruth Rendell or Barbara Vine. I also think she does a great job of connecting past and present – of weaving them together. I’m glad you liked this one. I haven’t read anything by Barbara Vine and I’m not such a fan of psychological suspense, but this book has always fascinated me. When I read Tana French’s The Likeness, some reviewers likened it to A Fatal Inversion. On the other hand, I just read Death in the Truffle Wood and loved it. It’s a real treat if one wants to imagine oneself in Provence with a farmer and his truffle-hunting pig. Yes, she’s a very sad figure. They’re all very young men, so I think it’s genuine ignorance at play rather than wilful ignorance. I was totally gripped by it when I read it, years ago, but never felt I wanted to read it again. It’s quite a trope now – the summer 20 years ago when the restless young people, on the edge of their lives, all living together in some striking spot, were involved in something they now want to forget. The Poison Tree by Erin Kelly is an example I recently read. But was RR/BV the original…?